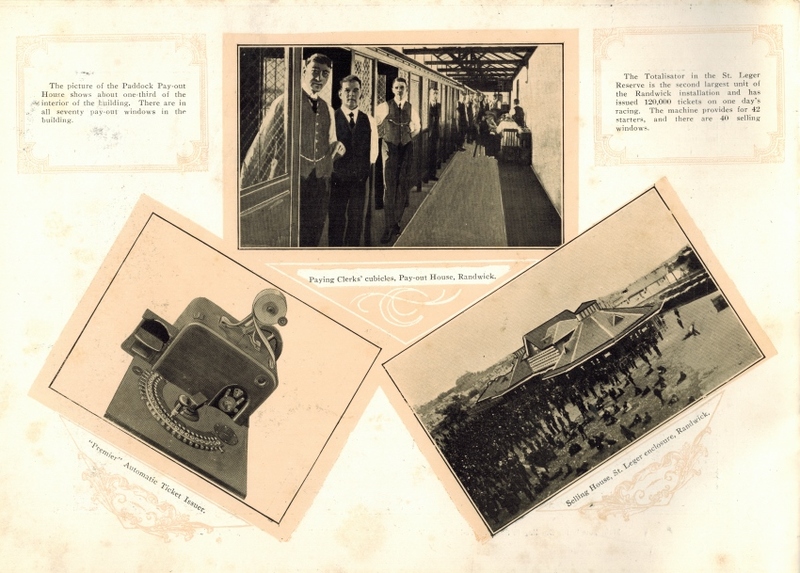 This history page contains a photograph which is one of several belonging to the photo gallery pages which are part of several pages relating to the invention of the world's first automatic totalizator in 1913 by George Julius, and Automatic Totalisators Limited the Australian company founded by George Julius to develop manufacture and export these systems. This image shows one of the three tote houses where the Julius Totalisator at Randwick Racecourse in Sydney was installed and commenced operation in 1917. This was the first automatic totalisator installed at Randwick and was the first of the large Julius Tote installations. 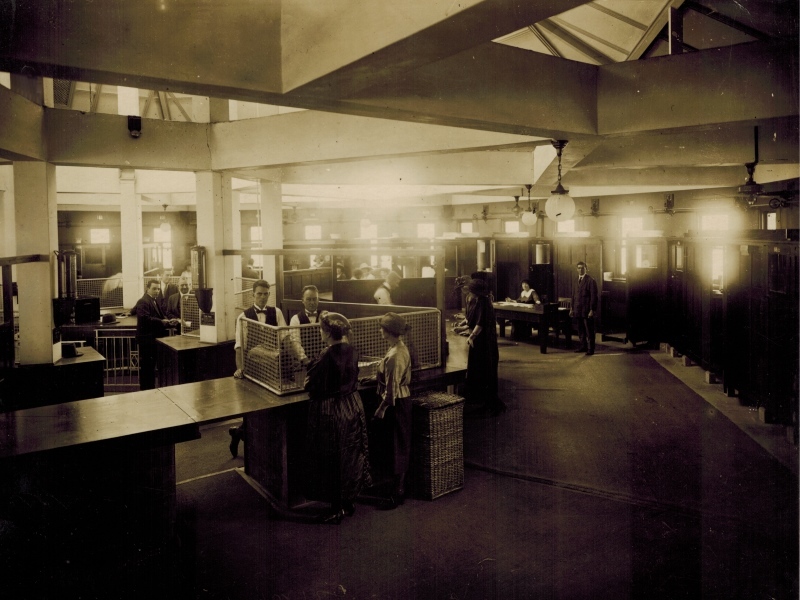 In 2017, whilst I am creating this page, it is hard to believe that the photograph shown in this image was taken 100 years ago, as was the photo showing the inside of this building, shown in the image below titled Inside the Randwick Paddock Tote House and probably the TIM (Ticket Issuing Machine) photograph shown in the image below titled The type of TIM used in the 1917 Randwick Tote system and the photograph of the Adder shown in the image titled The type of adder used in the 1917 Randwick Julius Tote as well! Not only is it the centennial of this Julius tote at Randwick it is also the vigentennial of this website, which started in 1997. Come to think of it, it is also the Quadragennial of my joining Automatic Totalisators Limited! An Automatic Totalisators Limited promotion document titled The PREMIER (JULIUS) AUTOMATIC TOTALISATOR , has a similar image showing this tote house during this era. The annotation for this image reads: FIG. 3. "Paddock" Installation on the Randwick Racecourse, Sydney, N.S.W. This is the first all-electric "Premier" Totalisator built and installed in 1917, and still in operation. There is no photographer's stamp on this photograph. The above image shows the old Main Tote House at Randwick which was custom built to house part of the 1917 Julius Tote. The left and right wings of the tote house are octagonal. The note on this photograph reads: Royal Randwick Paddock N.S.W. Australia Indicator For Pari-Mutuel Tote 60 20/20.1917. Much was made of the 1917 Randwick system being the first totalisator to implement electrical elements, making it electromechanical and hence noteworthy and likely to be photographed. 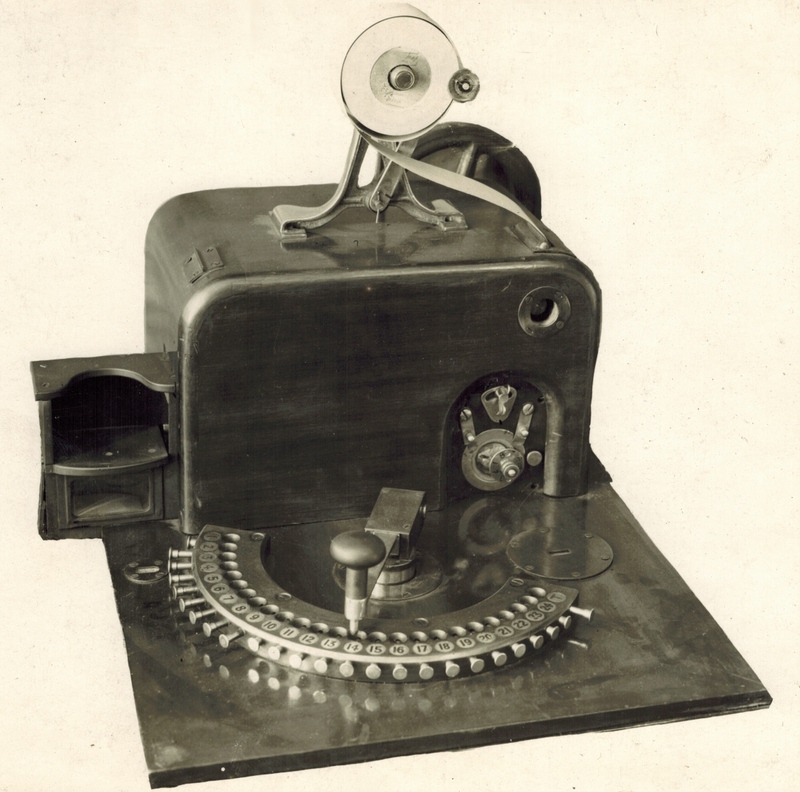 An example of this noteworthiness of this system is in the nickname All-Electric Totalisator, or as a British Pathé webpage calls it the wonderful electric Totalisator. This 1917 tote was a big system, with a total of 150 terminals and I consider it to be the world's first large-scale, on-line, real-time, multi-user system. The picture of the Paddock Pay-out House shows about one-third of the interior of the building. There are in all seventy pay-out windows in the building. The Totalisator in the St. Leger Reserve is the second largest unit of the Randwick installation and has issued 120,000 tickets on one day's racing. The machine provides for 42 starters, and there are 40 selling windows. The image above, as well as the rest of the Straight Betting booklet, is a historic example of artistic company product promotion in the early 1920s. Low image resolution was probably normal back then. Thanks to Bruce Rutter, who held multiple management positions with Automatic Totalisators Limited finally becoming General Manager, for giving me his copy of Straight Betting. Although this booklet is elegant with an ornate cover, it seems to be a pre release version of it. There is fountain pen writing on the front cover which reads Mr Raymonas with memos inside written below. The text has deletions and additions marked in it, some in pencil and others in fountain pen. View on Lawn at Randwick, showing the Selling House (on right) and Pay-out House (on left). Following is a paragraph extracted from page three of Straight Betting. Australia is not the original home of the Totalisator, but no sooner had the pari-mutuel system of betting been introduced into the country than the inventive genius of the Australian was challenged to produce a mechanical contrivance, the manipulation of which would depend as little as possible on human agency and which would do its work speedily and with absolute accuracy. The old-fashioned and crude method of selling tickets from boxes, one for each horse in a race, was soon discarded in favor of a machine. The inventiveness of the Australian, once set to work, gradually improved the machines which were first used until we now have the Premier Totalisator . 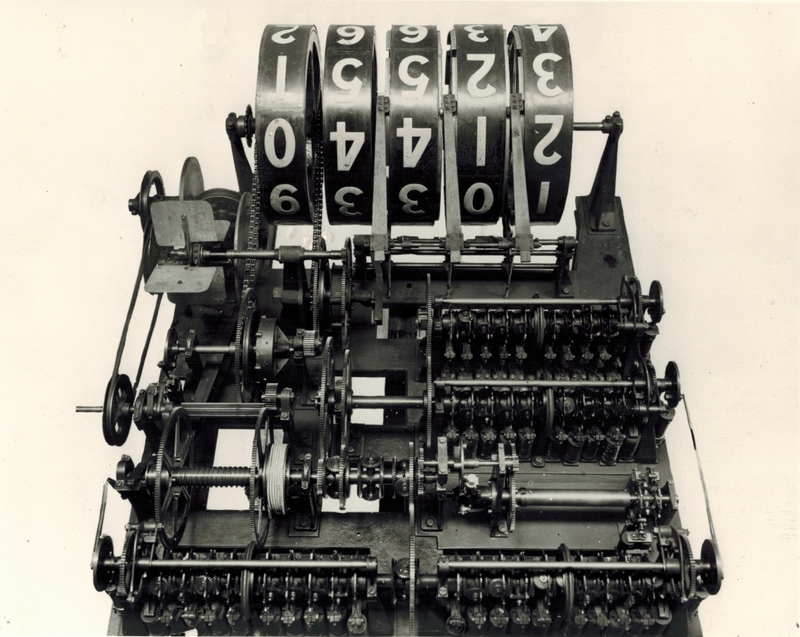 It can truly be claimed that this triumph of mechanism is perfect. It has been proved on many of the leading Australasian racecourses, and nowhere more thoroughly than at Randwick, Sydney, N.S.W., the premier racing centre in the Southern Hemisphere. There, in a single day over £120,000 has been handled by the machine with marvellous celerity and without the semblance of a growl or a grumble from one of its myriad clients. The following details regarding the photograph shown in the image at the top of this page, can only be seen in a much larger higher resolution version of this image, or the original photograph with a magnifying glass. Four of the windows in the central section of this building, to the right of the central entrance starting at the second window, seem to have 26b 26c 26d and 26e each followed by the word Change displayed on them respectively. The first and sixth windows to the right of the central entrance as well as the first and sixth windows to the left, seem to be closed and have an ornate sign on them that I cannot read. With conjecture, the first word in this sign may be WAR and the second could be LOAN with a third word below them for which I cannot even hazard a guess. If this speculation is correct they probably are a promotion for war bonds. Having mentioned the war, this is world war one which ended the following year. The fact that this is a war time photograph might have something to do with the names on the bookmaker signs in this photograph having been obliterated. The first window in the right hand octagon where it attaches to the central section of the building, has writing displaying 26 with £5 below. The 26 seems to be a window number. Following to the right are windows numbered 27 to 34 with £1 displayed below each of these window numbers. Similarly, the first window in the left hand octagon, where it attaches to the central section of the building, has writing displaying 1 with £5 below. Following to the left are windows numbered 2 to 9 with £1 displayed below each window number. Usually the best operators are assigned to the highest value windows. There is a link to the British Pathé Webpage mentioned above, which contains a video clip, which I deduce relates to this 1917 Randwick Julius Totalisator. This link can be found in the Three more ATL systems in Asia/Links to other pages chapter of this website. The links page can be found by selecting the Go to the index button in the navigation bar at the bottom of this page and then selecting the suggested chapter. 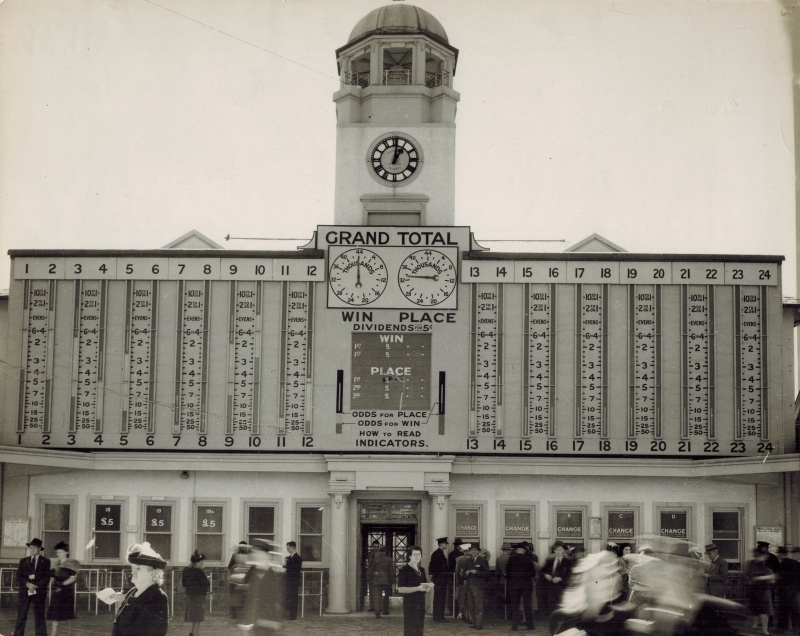 The beginning of the British Pathé video clip shows a good view of the indicator board of the totalisator, which it states is at a Sydney racetrack in 1927. The video clip section showing the indicator, is a very close up view and does not show any of the building it is installed in. What is visible however looks exactly like the indicator in the image above, located in the centre of the tote house below the central clock tower. The video clip then pans across this indicator and it becomes clear that the highest runner number on that indicator is 42, which matches the maximum field size of this 1917 Randwick system. Hence it is probable that the indicator in the video clip is the one shown in the image above. The British Pathé video clip, following the section showing the indicator, shows a teller entering a selling booth inside a tote house. The arrangement of the booths and the doors in the video clip look exactly like those in the image below, of this 1917 Randwick tote house. You can clearly see one of the changes of direction of the straight sections of booths in the video clip, which is in keeping with the octagonal shape of this building. This can also be seen in the image below by following the straight line of booths left at floor level from the right hand edge of the photo until it meets the next line of booths at 45 degrees. It is also clear from the video clip that the wooden walls and doors of the booths are all elevated off the floor and are standing on some type of bricks, which is also clearly visible in the image below. In conclusion, the sections of the video clip showing the inside of the totalisator building, provide credence to this video clip having been filmed at Randwick. The video clip also shows the teller operating the TIM inside the booth. The TIM in the video clip is clearly the same model shown in the image below titled The type of TIM used in the 1917 Randwick Tote system, which is the final piece of evidence that convinces me the British Pathé video clip was filmed at Randwick Racecourse. The photograph shown above is glued onto a cardboard backing and it is not possible to see if there is a photographers stamp on the back of the photo. I have another photograph of the above tote house which is a wider angle, in which the same people are in the picture. As that photograph bears a Hall & Co photographers stamp I presume the photograph shown in the image above was also taken by Hall & Co. Interior View of a section of the Selling House in Saddling Paddock at Randwick Racecourse, showing Selling Clerks paying in at the finish of the betting on a race. The TIMs like the one in the image below, were inside the booths that are around the perimeter of the tote house shown in the image above titled Inside the Randwick Paddock Tote House. None of these TIMs can be seen in the image above as they are inside the selling booths, however the drive shafts, drive pulleys and drive belts for these machines can be seen in a large version of this image. The horizontal drive shafts are attached to the walls above the booths and these can be seen in this image. These are supported by brackets on the walls which have bearings in them, within which the drive shaft rotates. They can be seen as small dark vertical oblong rectangles, best seen starting from the right hand side of the image following the outside wall just below the roof beam height above window height. The drive pulleys are hard to see in this relatively small image however there is one pulley that is visible from the side making it clearer. It is at the top right hand corner of the first window from the right hand side and it is protruding below the right hand fan blade of the nearest ceiling fan. Having located that, it is easy to see the rest of the drive shaft as it travels horizontally through this pulley and continues around the room. This now makes it easy to find the drive shaft mounting brackets previously mentioned as they all extend upwards from the drive shaft. The individual drive pulleys are on this shaft, one for each TIM in each of the selling booths. There is one drive belt clearly visible in this photo. The reason for this is that it is the main drive belt which rotates the drive shaft and it is a heavier belt than the individual TIM drive belts and there are two of them to ensure that the breaking of one of the belts does not stop all the machines attached to this drive shaft. It can be seen above the woman seated at the distant desk to the right of the centre of the image, with the man standing to the right of the desk. Looking up from the seated woman, two spherical lights are clearly visible in the foreground, suspended from the ceiling. Looking between the two white spheres of the lights you can see this belt rising up from the roof of the selling booth to a pulley on the drive shaft. This belt will be driven by a motor in the selling booth. The drive pulley on the TIMs, that all the pulleys on the drive shaft bar the pulley driving the shaft, are driving, can be seen in the following image at the right hand rear of the TIM. In the video clip, showing a seller operating one of these machines the drive pulley can be seen continually rotating, driven by the equipment described in the previous paragraph. Returning to the image of the TIM below, you can see a roll of paper mounted on the paper holder on the machine. Returning to the woman seated at the desk in the image above, to the right is a standing man then to the right of him is a booth door with a glass pane in it with a lot of light emanating from the booth. At the bottom centre of the window in the door, it is possible to just make out a relatively full paper roll which will be sitting on top of the machine in that booth. Having located that, you can just make out the drive pulley on the drive shaft directly above the paper roll and to the right of that drive pulley as one of the dark rectangular wall mounting points for the drive shaft. I do not understand the markings on these selling booth doors. The door with the ticket paper in it is labelled 85ff and the one on the left is 63jj and the one to the right looks like 56E. In the central part of the hexagonal tote house on the left side of the image above is the totalisator bank. It is here that the totalisator cash is controlled. It is interesting to note how strictly controlled access to this building was, as demonstrated in the Sun Newspaper article below titled RANDWICK TOTALISATOR. The underlined texts in the following paragraphs are not hypertext links they are replications of the original document. The Julius totes had manual payout requiring Payout Clerks. It is evident that these 1917 TIMs, were provided with two staff each to operate them, a Seller and an Issuer Operator. I do not think this was a requirement of the system to have two operators, but a legacy operational requirement. It is interesting that the Issuer Operator is instructed not to listen to the customer in this two person operation. I have read that when the Julius Tote at Longchamps started operations in 1928, the French race-club continued a two man operation, despite being advised that a single operator is all that is required. The two operator per selling window policy was continued to keep the customers happy. The manual effort required to achieve certainty in payment is interesting with the dividends being calculated up to ten times by each Paying Clerk then cross checked. It is also interesting to note that the technical staff maintaining these systems were called Mechanics. In the late 1970s after implementation of the first on course computer based totalisator systems in Brisbane, which superseded Julius totes, the technicians and engineers working on the computer systems were also called Mechanics by the operators. This continued for decades and in 2008 we still had the odd call now and again for a Mechanic! First see that ticket paper is correctly placed in the machine. Try one or more test tickets, noting that race number is correct and that sufficient ink is on machine (reserve all test tickets for manager). Close up all horse numbers on machine when window is closed. Await the hoisting of board showing final scratchings, then open up horse numbers shown. Be ready to issue tickets immediately window is opened. Do not issue any tickets until instructed to do so by the ticket seller. Pay no attention to numbers called for by investors, the ticket seller will ask you for tickets required. Should a ticket be issued through any cause and not sold, it must be handed to the Telephone Operator immediately the window is closed, with an explanation showing why it was issued, or otherwise the Ticket Issuer Operator will be held responsible. Immediately the window is closed, remove paper from issuer, leaving two partly printed tickets on roll, and put on new paper for next race. Change race number and proceed as before. Should issuer get out of order from any cause, turn switch off at once; the window should be closed immediately and signal given for Mechanic. On no account try to rectify same yourself; do not try to issue any more tickets until Mechanic has left cubicle. Get cash from bank before first race. Get cash afterwards from banker or selling clerk as directed, giving I.O.U. for same. When dividend is posted, work out dividends up to ten times and check same with next paying clerk, getting him to initial sheet, you initialling his. Open up window when signal to pay is given, and keep it open until it is clear; on no account close the window too soon. Fill in list of tickets paid, and return all notes (retaining silver), tickets paid and list to banker, who will give receipt for same. Each ticket must be cancelled as it is paid. Carefully scrutinise ticket and check same with sample ticket given you before paying same, so as to avoid paying out on wrong tickets; as paying clerks will be held responsible for any mistakes made. Should a legitimate doubt exist about tickets, ask the person tendering same to go to commission room or manager's room. Should any ticket be presented which appears to be forgery or has been altered (use great discretion in doing this), obtain posession of same and ring the bell under counter, which will immediately bring a detective; then hand ticket to the detective, pointing out person who tendered same. Should paying clerks be running short of change, pull out the sign for runner. Do not wait until change is exhausted; signal in time to prevent any stoppage in paying out. The top picture in the image above titled Page 2 Straight Betting annotated Paying Clerks' cubicles Pay-out House Randwick shows some of the Paying Clerks to whom the above instructions apply. The Julius totalisator in the Saddling Paddock at Randwick will be in operation on September 19 (Derby Day), and should the wire needed for that in the St Leger Reserve arrive from America, as expected, the St Leger machine will also be working on that day. A trial of the paddock tote will be made at an early date to ensure proper working when ready for business. It is interesting to note that the operation of the second machine was dependent on the delivery of wire from America. This 1917 Randwick Julius Tote installation consisted of three Julius tote systems. The St Leger machine can be seen bottom right in the image above titled Page 2 Straight Betting, and is annotated Selling House St. Leger enclosure Randwick. I have pleasure in stating that the "Premier" Automatic Totalisator Machines, which were installed at Randwick Racecourse and are operated by your Company on contract under the supervision of the Club, and which were first used at the Club's Spring Meeting, 1917, have, since their installation, given complete satisfaction. Their accuracy is unquestionable and the rapidity with which tickets are issued by the experienced operators leaves nothing to be desired. You will remember that during the last twelve months the ticket issuers in the Saddling Paddock Totalisator have been replaced with the latest model, and the capacity of the machinery re-modelled to operate 100 machines --73 of which are now in operation, giving the most satisfactory results. Below is an image of one of what C.W.Cropper refers to as the "Premier" Automatic Totalisator Machines, or in contemporary terminology TIMs (Ticket Issuing Machines) or Terminals. As previously mentioned, there were 150 of these supplied with the Randwick System. In the British Pathé webpage mentioned previously, the model of TIM shown above can be clearly seen in operation in the 1917 Randwick Julius Tote system, although the TIM as is shown above would not have been part of the 1917 Julius Tote. The reason for this is that the TIM above only supports 24 runners as can be seen by the runner numbers arranged in an arc, around which the runner selection handle sweeps. As has been mentioned previously the 1917 Randwick Julius Totalisator supported a maximum field size of 42. This TIM above however, would have been usable with the following Julius Totalisator at Randwick, which was installed in 1935 as the maximum field size for that system was 24. This is evident in the image of the Randwick Paddock Tote House in 1947, at the bottom of this page, as the maximum field size on the Julius Tote Odds Indicator is 24. Having mentioned that the above TIM would not have been used in the 1917 Randwick system it is very interesting to note that on page two of a company document titled Straight Betting, as shown above in the image titled Page 2 Straight Betting , there is a copy of the last image shown above. When I write a copy, not only is it the exact same machine, the image in the company document even has the mangled paper guide and a paper roll unravelling preventer washer, that looks like a blemish on the right hand perimeter of the paper roll on top of the machine! The adders like the one shown in the image below were housed in the machine room, which is in the central upper level under the central clock tower, in the image at the top of this page. The counter wheels of these adders were placed so they were visible from the outside in the long horizontal slot like windows in this building, which are aligned in 3 rows of 14 adders. Three rows of fourteen means there are 42 adders, one for each of the 42 possible runners in a race mentioned above. In the central tower below the clock, there are two indicators. The upper one, that looks like the taller of two horizontal black oblong rectangles in a white frame, is a dividends indicator, which is controlled manually. The lower one is the pool grand total indicator which is automatic and the grand total adder will be sitting behind this window. The third image after the one at the top of this page in the Photo Gallery of this website, shows a full sized version of the image of the TIM above. To view this click on the image at the top of this page and select the image thumbnail of the third thumbnail after the one relating to the image at the top of this page. The image after the one at the top of this page in the Photo Gallery of this website, shows a full sized version of the image of the adder shown below. To view this click on the image at the top of this page and select the image thumbnail after the one relating to the image at the top of this page. Following is a 1917 article from The Sun newspaper provided by the National Library of Australia Trove archive. The first totalisator erected at Randwick racecourse for the A.J.C. was inspected today by Mr. Fuller, Acting Premier, and other members of the Cabinet. The Ministerial party were met by Mr. Cropper, secretary of the A.J.C., and members of the committee. The mechanism was explained by Mr. Julius, the Inventor of the machine. The building, which is one of three to be erected on the course, cost £16,000, and the machinery which has been Installed cost another £25,000. The whole of the mechanism was made at the Automatic Totalisator Company's own factory in Alice-street, Newtown. The totalisator has discs showing for a field of 42 horses. Each revolving disc is capable of dealing with 99,999 tickets. The mechanism is electrically controlled, and is operated by a switch in the stewards' room. The reason for this is to give entire control of the betting to the club. If a race is timed to start at 2 o'clock, the steward touches the switch and instantly the whole apparatus is brought to a standstill, and there can be no betting while the race is in progress. On the other hand immediately the betting on the next race is timed to start, the switch is put over by the steward, and away it goes. The electric power is from the public mains, but there is an additional gear on the ground in case of accident, which is always ready to operate. Webmaster's note: The discs showing for a field of 42 horses mentioned in the paragraph above, refer to the counter wheel display wheels at the back of the 42 horse adders like the one shown in the image above. The 99,999 tickets mentioned above refers to the maximum number that can be recorded in the counter wheels at the back of the adder in the image above. The interior of the building, to which no member of the public, or even the committee, will be admitted, is a huge banking chamber, in which an army of clerks will work. Beneath the banking chamber is a strong room fitted with nests of safes. The whole of the building is fitted through out with electric clocks, and also in the tower, for the public to see, the master clock being in the stewards' room. There are two other totalisator buildings being erected on the course, the total cost of the structures themselves being £32,000, and the mechanical installation approximately £70,000, making a total expenditure of £100,000. The architects are Robertson and Marks and the contractors Howie and Moffat, Ltd.
Dividends can be collected at all times during the day, there being a late dividend window. It is advisable, however, to collect immediately after the race. In the event of a winner failing to present the ticket the money may he collected next day at the office of the company, 4 Bridge-street, Sydney. Other Ministers present at the inspection were Mr. Ball, Minister for Works and Rail ways: Mr. Fltzpatrick, Minister for Mines: Mr. James, Minister for Education; Mr. D. Storey, Acting Minister for Health; Mr. Graham, Minister for Agriculture; and Mr.Garland, Minister for Justice. It is interesting that this article mentions that for dividends to be collected after the race-day, patrons have to visit the Automatic Totalisators Office in Bridge Street in the city. Automatic Totalisators Limited later had an office at Randwick Racecourse and the payment of these other day dividends would be part of the reason for this. In December 2015, Narelle and I visited the State Library of New South Wales and looked at their comprehensive set of Sydney Telephone Books on Microfiche spanning 1889 to 1950. The May 1934 Phone Book entry shows the Automatic Totalisators Limited factory had moved from Alice Street Newtown, where the 1917 Randwick Julius tote was manufactured, to 182 Chalmers Street, with a depot in Central Street in the city and an office at Randwick Racecourse. The earliest prominent manager of Automatic Totalisators Limited was Frederick Augustus Wilkinson. He had a strong background in engineering and started out as a design engineer. George Julius and he designed an electromechanical ticket issuing machine together, to be used with Julius tote systems. Frederick worked for Automatic Totalisators Limited for three decades and became the State Tote Manager. He worked closely with George and travelled widely for the company. 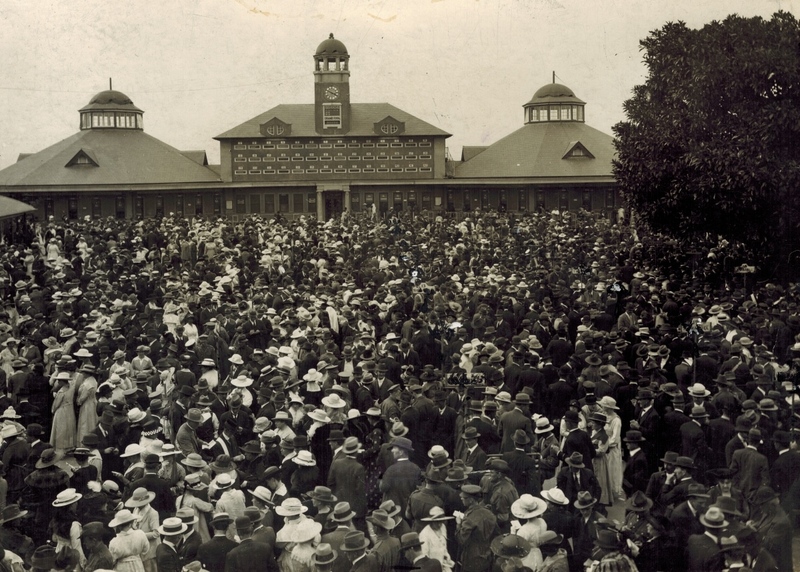 The following comment was written by Rudolph F. Wilkinson, son of Frederick Augustus Wilkinson: About 1916, the tote was installed at Randwick Racecourse and what a runaway success. FW was Course Manager until he retired about 1952 except when he was overseas at India, Java, Canada, France, UK, and South Africa on sales promotions with George Julius. Following is an image of the Royal Randwick Paddock Tote in 1947. Although the 1917 Julius Tote was replaced by a more modern Julius Tote in 1935, I have presented this image here as a later view of this tote house. This image belongs here as the Randwick Paddock Tote House and the Julius Tote, although this is a more modern one, is the subject of this page. The Photographers Stamp on the above photograph is Hall & Co.
As can be seen a brand new indicator board has been installed in front of the old indicator. This new indicator installation probably took place when the new Julius Tote was installed here in 1935, although Julius Tote odds indicators were available since 1927. It is probable that the cost to upgrade the adders of the first Julius Tote installed here, to drive this type of indicator board would have been prohibitive. This indicator is a barometer odds display and shows the odds whilst the earlier indicator only showed the investment totals of each runner leaving the punter with some mental arithmetic to work out what his respective dividend might be. It is interesting to note that the maximum field size has reduced significantly since the 1917 Julius tote, down to 24 from 42. It is also interesting to read the instructions on how to read the barometer indicators, written on the bottom centre of the board. Also note that this system supports Win and Place pools whilst the 1917 Julius Tote only supported one pool. Also note the Win and Place pool Grand Total indicators in the centre of the board below the clock tower have clock face type displays. It is additionally interesting to note that the shutter speeds of cameras were a lot slower in 1947 when the above photograph was taken, which is evidenced by the two people in the bottom right of the above image appearing blurred. They must have been in motion when the photo was being taken and the camera shutter was open. The Previous page in this website looks at an electromechanical Raceday Control Console at Harold Park and the transition of totalisators from electromechanical to computer based systems.